Grand HIRAFU boasts the largest size in the Niseko area, offering the best powder snow and a wide variety of 30 courses, including wide ski trails and parks. The resort offers new and convenient facilities such as .Base, the Mountain Center and the high-speed 8-person HIRAFU Gondola. The foot of the mountain is home to many hotels, condominiums, restaurants and hot springs, allowing you to enjoy your time after a hard day on the slopes. Grand HIRAFU has 30 ski trails and 15 lifts and gondolas, so you can choose what’s right for you, regardless whether you’re a beginner or an expert. Allow yourself to enjoy the best powder snow while gazing upon Mt. Yotei, which occupies a prized position on Japan’s list of 100 famous mountains. If you’re here in the summer, let the summer gondola show you a panorama view of Mt. Yotei and the Niseko area. We have gear for all ages, from kids to seniors, so you can enjoy the world’s best powder snow with the newest gear. 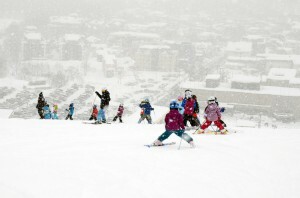 The snow school offers lessons to not only beginners, but also offers programs for advanced skiers and snowboarders. Our instructors work hard to hear the students say “It’s always fun to learn here!” at the end of the lesson. Throughout the season, Grand HIRAFU runs a wide variety of events including public demos of the newest models, and competitions of different levels, from family events to timed races where every second counts. For details of past events, and announcements about future events, please see our blog. You can book online, including accommodation, lessons at the snow school, and the rental of gear such as skis or snowboards. Even if it’s your first time on the snow, you can have a fun and safe time skiing or snowboarding at Grand HIRAFU. Copyright　NISEKO Mt. RESORT Grand HIRAFU.All Rights Reserved.